So I’m back and ready to catch up on all of your comments for the last week or so. Thank you for all your comments. I am ready to get back to everyday life. At least for a bit. 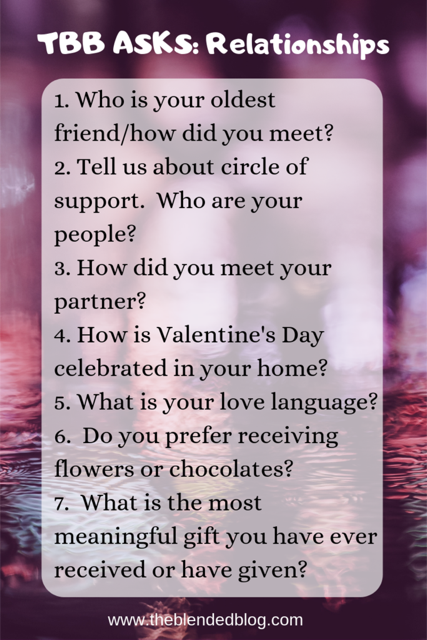 Today is a TBB Asks post and the topic is relationships. .
1. Who is your oldest friend/how did you meet? Well other than family, that would be Brandy. We met when we were super young. Like Kindergarten. Even though we have families, busy work schedules and life that gets in the way, we try to meet up a few times a year. I wish it was more but we live about an hour apart. 2. Tell us about circle of support. Who are your people? Well my blogging community. I have made the best friends who listen to my rants, who answer my texts at all hour and are there cheering me on. Also my family. Immediate and extended. My family watches the girls, comes to all the parties, celebrations, dinners and everything in between. 3. How did you meet your partner? At work in October 2006. 4. How is Valentines Day celebrated in your home? We usually do a dinner at home now that we have kids. I usually get Valentine cards and goodies for my kids and husband and keep it simple. 5. What is your love language? I still need to take a test and really find out. 6. Do you prefer receiving flowers or chocolates? Flowers. But I have a ton of chocolates that I just brought back from Belgium so everyone is getting chocolate this time. 7. What is the most meaningful gift you have ever received or given? Wow that is hard. I did give Rory a Valentine’s gift of concert tickets to see Black Keys and a weekend getaway with it. But otherwise it would be a sentimental piece of jewelry that I have received. Like pearls for graduation from my parents or many pieces of jewelry that Rory gave me that we’re stolen when our house was broken into in 2011. Belgium chocolates are so good! But I love flowers too. This was so sweet and I hope you have a marvelous Monday! Thank you so much Andrea! all the chocolate but Belgian is the best. I have been eating way too much of it. Oh man Belgian chocolate is the best!! My oldest friend is Jenn, I mean she was my wombmate first. hahah That always makes me laugh. I don't think I've had Belgian chocolate before...I think that needs to change! Thanks for linking up with us! It is soooo good. I got a bunch on my recent trip and I can't stop eating them. Belgian chocolate must be delicious! I agree on sentimental jewelry like my rings and my grandma's diamond! Those are the best gifts. It is amazing chocolate. I love pieces of jewelry that are keepsakes. Did you ever get your jewelry back that was stolen? That's just the worst. I dont get people that think they can just take things!!!! You're still friends with someone you met in kindergarten? That is amazing! Sorry to hear about your necklace.. it must have been hard to lose such a precious piece. Yes I am. Though we don't get to hang out often enough, we are still friends and keep in contact. It was sooo difficult to lose those pieces of jewelry, but I am slowly building my collection up. I've never done the love language test either, maybe I should. I think I should too. I can't imagine any of your loved ones will be mad about Belgian chocolate! Yummm. My love language is Quality Time, which is so spot on. I'll be interested to hear what yours is once you take the test! No they won't be. Ha. Oh that is a good one. I love QT. Isn't it neat how a blogging community can become some of your favourite people? Loved reading your answer, thanks for linking up! It really is neat and so much fun. I love that. I really have to take the Love Language test everyone is talking about!! The sentimental gifts are the best...but so are gifts that are experiences! So win-win!! Have a great Valentine's Day with family!! Me too. I have meant to in the past but never did. I hope you have a great Valentine's day too! I love that you answered the blogging community is a big support for you. I love this group that I am meeting through doing something I love. I bet the chocolates you brought back are to die for!! I love it too. It is even better when you get to meet them in person after connecting!!! The chocolates are amazing!! !